The essential process of masonry crack repair is facilitated with high-performance grout, which is often specified for its superior quality. Twistfix are proud suppliers of WHO-60 grout, used to effectively bond retrofit helical bars into position. Our products are the only proven bar and grout combination with load tables issued by the BRE (Building Research Estab­lis­hment) following extensive testing. When crack stitching bars are installed into walls and brickwork, they must be firmly anchored into place. This calls for the use of WHO-60, which has an innovative formulation of polymeric resin powder/liquid components combined expertly with cement to produce a cohesive, smooth and easily-worked grout. 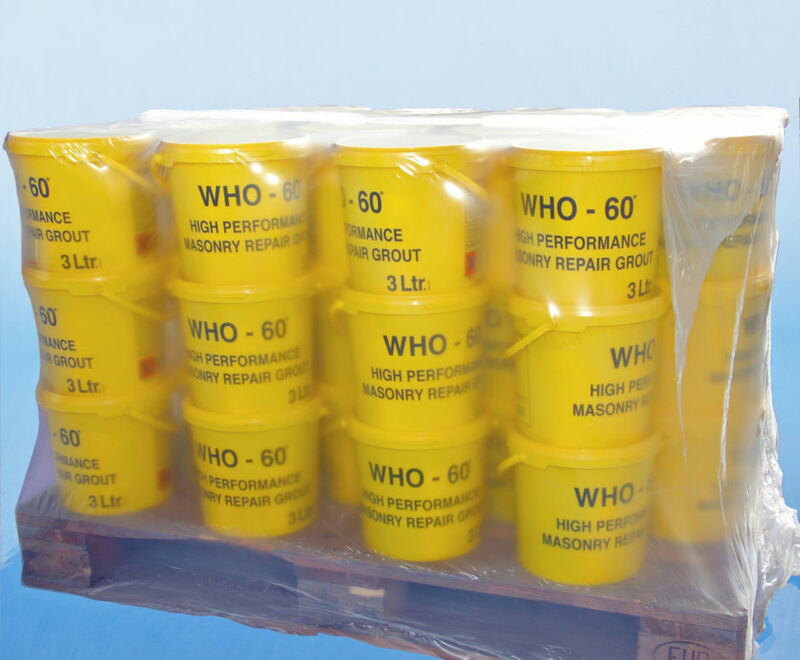 WHO-60 masonry repair grout is thixotropic, meaning that its viscosity prior to solidifying decreases with stress, for example when stirring and applying. This makes it incredibly easy to work with and, as such, it can be effectively applied with trowel or mortar gun. When mixed according to the given specifi­cations, the WHO-60 brick stitching grout supplied by Twistfix renders three litres of product. As with all of the masonry repair, damp proofing, cellar tanking and insulation solutions we offer, all necessary precautions should be taken when using WHO-60 masonry stitching grout. Through our many years of experience, we have learned to recognise that speed is often key in renovation and construction work and so we endeavour to deliver all of our products, including WHO-60 masonry grout, as quickly as possible. WHO-60 masonry repair grout is included in many of our 'everything - you - need' kits including our Arch Repair Kit, Brick Pinning Kit and our best selling Crack Stitching Kit. A regular purchaser from Twistfix left a review after buying this product that states they ‘ordered stitching grout one day, received (it) the next’. This swift and efficient delivery also led the reviewer to add that we were ‘spot on’ with our service! Find out more about the many superlative qualities possessed by WHO-60 masonry repair grout by calling 0845 123 6006 or email sales@twistfix.co.uk.